The XL 110 Low-Profile HDG features a loaded deck height of only 15 in. (38 cm). With a capacity of 110,000 lbs. (49,895 kg) in 12 ft. (3.6 m), the unit is ideal for versatile hauling in construction and commercial applications. 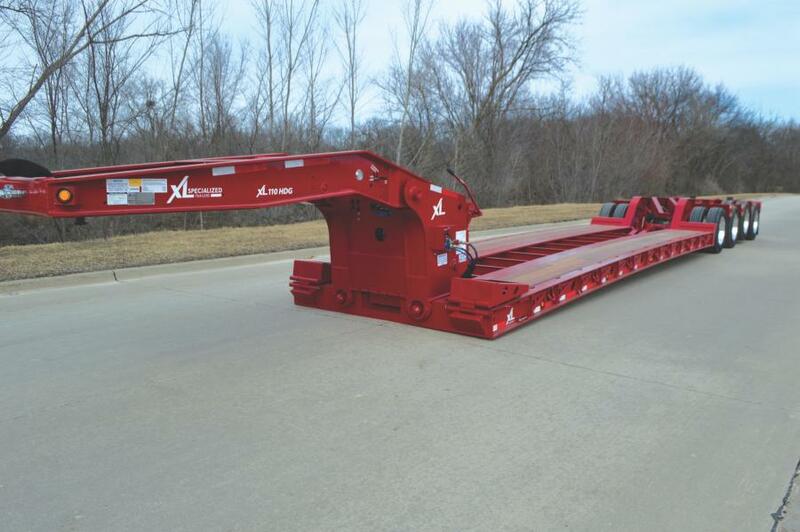 XL Specialized Trailers is adding its low-profile hydraulic detachable gooseneck (HDG) trailer to its lineup. The XL 110 Low-Profile HDG features a loaded deck height of only 15 in. (38 cm). With a capacity of 110,000 lbs. (49,895 kg) in 12 ft. (3.6 m), the unit is ideal for versatile hauling in construction and commercial applications. The 13-ft. (3.9 m) gooseneck has a swing clearance of 110 in. (279 cm), and the relief cut out in the gooseneck provides additional space between the truck and trailer. To save time while loading and unloading, the trailer's long neck is easily removable through the use of a wet kit or with a power unit. The neck also offers a five-position ride height. Based on neck position and load, the deck can be leveled as needed with the adjustable wheel area ride height. Additionally, a work light is positioned in the upper deck as an added safety benefit for loading and better visibility when monitoring the load at night. The main decks on XL's Low-Profile HDG's are strong, built with T-1 flange and 80k webs, as well as 6-in. (15.2 cm) and 4-in. (10 cm) stubbed junior i-beams on 12-in. (30.5 cm) centers. A wood stronger than oak, Apitong decking is standard on the main deck and stands up to years of wear and tear. With the 15-in. (38 cm) deck height and 4.5-in. (11.4 cm) ground clearance, this flat deck lowboy can accommodate loads that may otherwise require a dropside trailer. The Low-Profile HDG offers construction-focused and customer-friendly features. The deep bucket well in the rear provides an area for an excavator bucket to ride safely without detaching the lower boom section. The main deck offers many tie-down points with four flat d-rings inside both the front toolbox and bucket well, seven pairs of bent d-rings along the outer beams, 13 chain drops per side and swing out outriggers on 24-in. (61 cm) centers. The wheel area includes bolt-on heavy-duty wheel covers. To decrease wear on the tires, the third axle airlift can lift up when it is not needed. Finally, the frame of the XL Low-Profile HDG is prepped for a flip axle, allowing drivers to add a fourth axle when necessary.